Robert Rainey was the son of George and Mary Rainey. Robert was born about 1893 in Errigal, Ballygawley, Co. Tyrone. 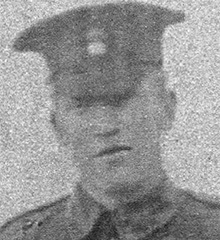 Private Robert Rainey was serving with the 9th Battalion of the Royal Inniskilling Fusiliers when he died of pneumonia in France on 22 November 1915. Robert was 22 years old. 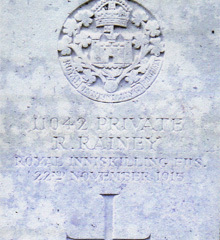 Private Rainey was one of three soldier sons. Robert and William George Rainey were killed and the third was discharged on account of wounds.